Program leader, Mohammad Khan, MD, PhD, with 2016 scholarship recipient, Vishal Dhere, MD. 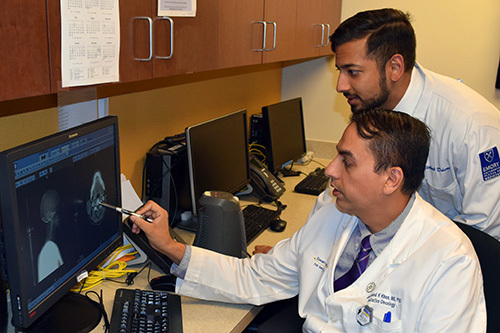 Winship's Department of Radiation Oncology has announced the 2017 Medical Student Scholars Program. Any student at an accredited U.S. medical school is eligible to apply for this scholarship award which focuses on research activities in all facets of oncology including diagnosis, treatment, and cancer prevention. The winner is required to work for two months this year under the direct mentorship of a faculty member based at Emory University. Applications are due by June 1, 2017.